Paprika is the recipe manager app I use on my iPad and iPhone that has literally been a GAME CHANGER for me in the kitchen. I would even go so far as to say it's the best app I've ever downloaded and is so well constructed that after 2 years of using it, there's not a thing I would change. And, that says a lot as I am tech junkie and always looking for ways to improve what's out there. This is the only recipe manager you will ever need. Period. And it's only $4.99. Create your own recipe box and store recipes from the web and/or add your own. You can create your own categories (bread, desserts, chicken, etc). 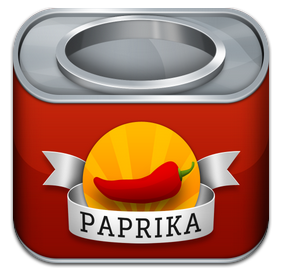 Paprika has a web browser in the app so you can browse the internet and find recipes. If you find a recipe you like, all you have to do is press the "Save Recipe" button and it automatically saves to your recipe box. It also has bookmarks so you can save your favorite sites for quick and easy browsing. LOVE this! You can create your own shopping list from any recipe and add multiple recipes to your shopping list. The list can be customized to add your own items as well. I use this on my iPhone and it has replaced another grocery list app that I had been using. Incredibly handy and efficient. You can create a meal plan and add multiple recipes to each day for breakfast, lunch, snacks and dinner. This is great for creating your grocery list. Best part of this feature is that you can have this screen open when you are cooking and it allows you to toggle between the recipes and cook dishes simultaneously! So incredibly handy! Paprika is also available for the computer if you don't have an iPad or iPhone. I find the experience best on the iPad because I have it in the kitchen with me while I'm cooking and it literally replaces the cookbook. Incredibly convenient to toggle between recipes if you are making several dishes. You can download the app through iTunes or click here to go to the website. Note: this is a personal endorsement for Paprika and I have not been paid to write this. Happy Cooking...hope you enjoy this app as much as I do!